If you are like me, you are probably eyeing this book cover suspiciously. It has the cursed Anne movie pictured on the front cover: that piece of Anne-heresy that should never have been brought to life on film. 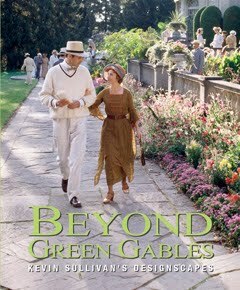 I saw the title - Beyond Green Gables - and the picture on the Sullivan website and bypassed it immediately. Then, last January I hosted an Anne of Green Gables Brunch in my home and at the close my lovely friend gifted me with a copy of this book. I opened it up and was instantly delighted by the contents. You should really focus on the second half of the title when considering this book: Kevin Sullivan's Designscapes . For truly, even though Sullivan did make several consecutive bad movie making decision choices (like this one) after completing Anne Of Green Gables - The Sequel , he can still be credited with bringing Anne to life beautifully through actress Megan Follows. I will never, ever watch another adaptation of my beloved book on screen. Megan Follows it is (for me)! This book of Designscapes allows me to revel in Anne-world as Sullivan originally created it to be. "Telling stories through pictures has been a lifelong pursuit. For over twenty years I have been transfixed by light passing through celluloid film. Watching films play in the imagination of an audience and witnessing t hem enlighten people about their own lives, I have learned a great deal about the human condition. My form of storytelling, however, has mostly sought to comprehend why family, community and traditions are important to every culture. Watching man's foibles in the safety of the cinema has taught me a great deal about why movies have the power to be life altering. Whether the characters we enjoy onscreen are rich or poor, cruel or kind, our fascination with their lives is interviewed in our mutual humanity." He goes on to explain how the inspiration to make a film has much to do with the environment where a performance takes place. This makes perfect sense to me as a photographer. Jonathan and I are hugely inspired by our surroundings and the settings in which we take pictures of people. Our ability to be creative correlates with our environment. Scenes do help make a story and can explain relationships. It's curious how this works but I can definitely attest to the truth of what Sullivan is saying. Given the fact that environments help produce emotions and stunning performances from his actors and actresses, it is delightful to hear that he took such care to create beautiful environments for his characters to find a home in. Again, I like the truth in this: beauty has an effect. This book is wonderful not just to see how the world of Anne was created, but it is a wonderful reminder to me to strive to create a home atmosphere that is beautiful. By that I mean that it is important, first and foremost, to make sure that the family relationships are properly harmonious. Also, I mean that our home should kept clean so that it remains an inviting place for us to live in. The fact is, the way our home looks can settle a child's spirit, can birth imagination, and can promote peace. Or, the flip-side could also be true; it could leave us feeling stressed, depressed and unwilling to engage with life. If I were to face facts (by why do so, really?) - this book is probably going to be most loved and enjoyed by an Anne fan. Particularly one who loves the movies. Bonus points if she likes to throw themed parties and loves books like these for added inspiration. Obviously, my friend knows me well and gave me a unique gift which I will treasure always. "Coincidentally" (something I forgot to tell her . . .) - this book was the very first I received back after the great smoke-out last February. It was also the last one I looked at before the smoke-out. I thought it rather fitting that I was immersed in the idea of creating beauty in my present environment before being ousted from my home (and placed into temporary housing) and received it back the moment I was returned home. Every so often I slip this book off the shelf and just browse. Because it has brought me such pleasure, I have to share it during the LMM Reading Challenge, just in case you hadn't heard of it before! From one Anne fan to another - you've got to check this one out! :) How about a good surprise from a friend! I would have been suspicious, too. I'm glad your friend looked past the first part of the title! Did you know there was yet another heresy? "Anne of Green Gables: A New Beginning." From the reviews it is even more a mess than the last movie that *doesn't* exist. @Becky - Yes! That's the one I linked to. I watched it. Coincidence that the actress who plays Anne in THAT fiasco also plays the evil queen mother in Once Upon a Time? I think NOT! I WAS suspicious but it was on your page, so I knew you would handle it properly! Don't get me started on the whole Sullivan continuing debacle!! I would have been suspicious, too, given the Anne movies he made after the first two. But he does make beautiful films, and I can imagine this would have some lovely photos and great information. I too am spoiled by Megan Follows and refuse to watch any other adaptation. ;) I've been reading Anne of Green Gables for the past two days as my bedtime reading and have been THOROUGHLY enjoying it. I love that book! We managed an Anne of Green Gables movie party and tea on the second. My girls got to watch it for the first time. I didn't plan the party, but it worked out beautifully for the LMM Reading Challenge. I made toothsome raspberry tarts and egg salad sandwiches. We had liniment free cake, ice cream, and raspberry cordial. We are such purists that we watched the movies on VHS from the original release.